Development Horizons by Lawrence Haddad: Hans Rosling? Eh..
OK, I admit it, I am constantly bemused by the bouquets and applause that rain down on Professor Hans Rosling, the medical researcher and public speaker (left). Jealousy you say? No, really, I am genuinely bemused. The latest video to hit our screens takes 10 minutes to show us that fertility rates are falling all over the world--at all income levels and for all religions. It shouldn't take 10 minutes. Yes, the moving bubbles are a nice innovation, but I have to admit I find them distracting at times. Yes, Prof. Rosling is an engaging speaker, and there are certainly plenty of terrible presenters in the ranks of the research world, but there are plenty of good ones too. Have you ever seen Lant Pritchett present? See how beautifully he communicates a complex and profound idea in less than 2 minutes. Perhaps Prof. Rosling is best appreciated by those who are not researchers? In any case, I have a touch of the Larry David (right) when it comes to Prof. Rosling, and I thought I better 'fess up. Am I the only one? What am I missing? "Perhaps Prof. Rosling is best appreciated by those who are not researchers?" That really doesn't sound like a bad thing at all, does it? If that is the case, then it probably evidence of how Rosling is able to draw public interest to global issues that would otherwise be as interesting as watching hair grow to the non-researchers, largely because the convoluted and jargon-ridden communicative styles of most researchers. Hans Rosling communicates well with the general public, Lant Pritchett with economists. I agree that Lant can be an effective communicator, but the example you give does not seem very profound. Lant also showed before the recent appointment of the WB President that he might have a bit of the Larry David about him and this does not necessarily appeal to all people. 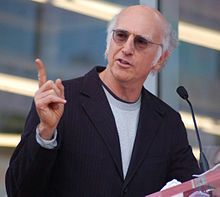 In the spirit of fun, could I suggest that we get Larry David to make a 10 minute presentation on falling fertility rates? I would fully agree with the first comment. Although I am a student at IDS and although I am someone who engages with academic jargon on a daily basis, I am also someone who thinks that researchers try too hard to write as technically confusing as possible. Sometimes I do wonder if they actually understand what it is that they are writing or whether they simply use synonyms for every word they want to use. Almost like Joey in FRIENDS when he wants to sound 'smart'. Unfortunately I have been unable to locate it, but I think that Robert Chambers poem from the 1990s on academic speak is an excellent criticism of the language researchers try to communicate in with the public. 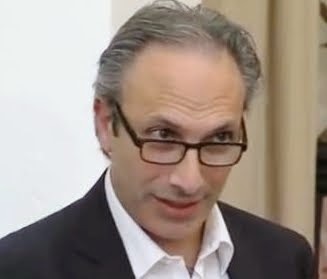 In his poem he points out that there is no need to package up good ideas in as complicated a way as possible and that it is a good thing to be able to write simply, since not everyone speaks English as well as native English speaking academics. Surely by writing as complicated as possible we are excluding a large part of the population and so too numerous great intellectual thinkers who happen to use different languages. Sometimes simple is better and often simple goes further. In a world that is constantly changing and becoming evermore complicated, the simple things become more appealing to me. Therefore, along with anonymous comment 1 and along with Robert Chambers, I too compliment those who can explain ideas in a manner that appeals to more people and in a manner which secures their attention for longer than merely the beginning few seconds of a presentation held by someone who appears to be trying to show us how well he can command the English language. The wider the message can be passed on, the more likely it is to be heard and acted upon. 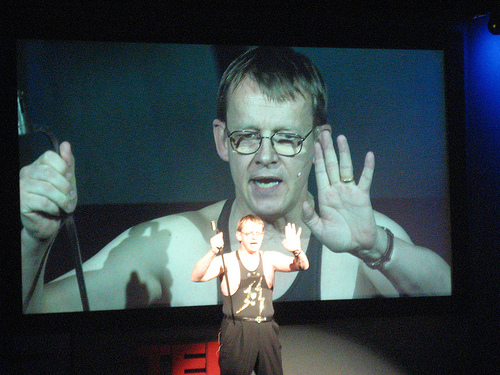 If not as funny and eccentric as Hans Rosling, many a researcher would do better communicating in a language that ordinary people use; the same people they actually try to help (or so they say, but that is another discussion). Even tamely criticizing Hans Rosling is probably the most controversial thing I've heard from your blog. But I wonder if you're comparing like with like? Perhaps some people would go for 10 minutes of entertainment rather than 2 minutes of information. If Rosling can slip the information in at the same time, it's worth his while spending the extra 8 minutes on the entertainment. But I also think he's overrated.